If you go by normal route on Breithorn, then he could be one of the easiest 4000 metre peaks in the Alps. You can go to 3820 m by skilift. From there you have easy walk on glacier, and snow slope to summit. Very recommended to go there on skis. The name Breithorn from German is: "broad peak/mountain". Breithorn (4164 m) is a mountain of the Pennine Alps, located on the border between Switzerland and Italy. It lies on the main chain of the Alps, approximately halfway between the Matterhorn and Monte Rosa and east of the Theodul Pass. 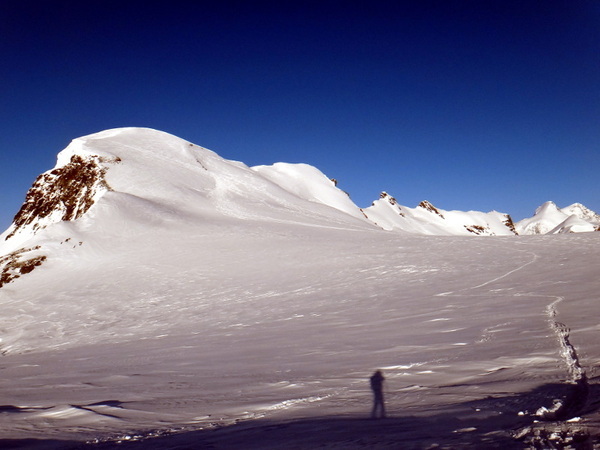 Most of the massif is glaciated and includes several subsidiary peaks, all located east of the main summit: the Central Breithorn, the Eastern Breithorn, the Breithornzwillinge and the Roccia Nera.